"From the acclaimed Egyptian-born author, gorgeous musings on longing and memory fueled by travel. A virtuoso in literary criticism, memoir and fiction (Eight White Nights, 2010, etc. ), Aciman revisits themes that have obsessed him since his youth growing up in Alexandria, when he and his family were waiting for years for visas to migrate to Europe, then the United States. Anticipation-and all the longing it held-proved the ideal, romantic, satisfying state, rather than the actual delivery. For example, longing for America all those years proved much more delicious and lasting than the actual naked reality of living there. In each essay, Aciman elegantly palpates these themes of place and displacement ('dispersion, evasion, ambivalence'). In 'Lavender, ' the myriad scents of aftershave he will discover over the years mark milestones in his life, but hark back essentially to the first, significant scent of his father's lavender aftershave. Initiating his young sons into the memories of his youth, in 'Intimacy, ' involves taking them back to Via Clelia in Rome, where the author 40 years before lived in limbo with his family for three years while waiting for their visas to America. For Aciman, who was poor, speaking Italian self-consciously with a foreign accent, it was a time of shame, yet writing about it helps unlock the 'numbness' and encourages 'dream-making.' In 'Temporizing, ' through the personal exploration of his family's Marrano roots, the author fashions a brilliantly subtle excursus on the craft of a writer such as Proust, who avoids the tyranny of the particular, the day-to-day, by circumventing pain and sorrow at all costs, and passing all experience through 'the literary time filter.' Aciman's own travel essays-on Venice, the Place des Vosges, Tuscany, Barcelona and New York-filter the present through an ever-shifting palette of sensuous memory and impression. "Shame, which is the reluctance to be who we're not even sure we are, could end up being the deepest thing about us, deeper even than who we are, as though beyond identity were buried reefs and sunken cities teeming with creatures we couldn't begin to name because they came long before us.'" You might think for a moment that these words belong to Freud or Kafka, but neither could have addressed the subject with quite the same elegance and lyricism-poetry, really-as the Egyptian Jewish émigré writer André Aciman. The quote comes from an essay about the author's summer vacation in Rome that is included in his latest collection, Alibis: Essays on Elsewhere. This is what most of his travels, detailed in this book, have been like. 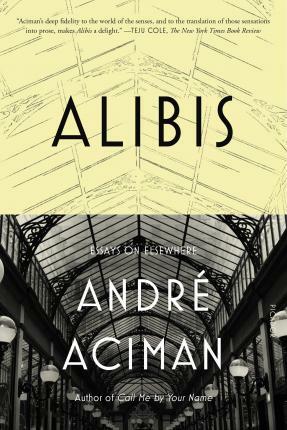 Aciman is neither a thrill-seeking tourist nor a sophisticated Baudelarian flâneur, but rather a man in search of intense and unexpected moments of introspection, which are triggered by the various settings and cultures he encounters . . . In Aciman's writing, behind a facade of discussions, reminiscence, and contemplation there appear sudden slippages, admissions into the world of 'ancient riffs and sunken cities' that are fraught with truths that cannot be experienced other than through hints and insinuations. André Aciman is the author of Eight White Nights, Call Me by Your Name, Out of Egypt, and False Papers, and is the editor of The Proust Project (all published by FSG). He teaches comparative literature at the Graduate Center of the City University of New York. He lives with his wife and family in Manhattan.